Daddy Long Leg Spiders are also known as cellar spiders or Gran Daddy Spiders and are found throughout Australia in the corners of most homes and buildings. It widely thought that Daddy Long Leg Spiders were the most poisonous spiders and the only reason that they did not bite and inject their venom into humans was the fact that their fangs were too short. This has been proven not true by many entomologists. The male Daddy Long Leg spider is smaller than the female Daddy Long Leg Spider being at 16mm with the female being 20mm. Daddy Long Spiders have a cylinder body which is usually a creamish to brown color with their 8 slender legs being very long hence how they got the name Daddy Long Leg Spiders. Daddy Long Leg Spiders have sensors in their legs and will detect any movements or vibrations which are close to them. Daddy Long Leg Spiders are not like most other spiders they only have 6 eyes whereas most other spiders have 8 eyes. Daddy Long Leg Spiders are found in homes and buildings in the corners of the ceilings and walls, unmoved furniture, patios under furniture, behind doors, garages and sheds. Daddy Long Leg Spiders are known for their messy webs and if felt threatened they will spin their web so they become a blur. 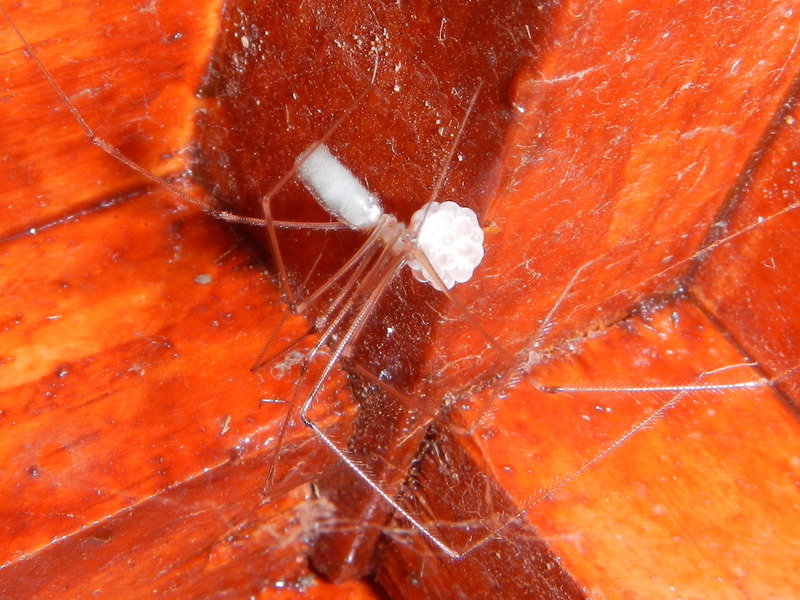 After Daddy Long Leg Spiders mate the female Daddy Long Leg Spider will produce tiny white eggs. The female Daddy Long Leg Spider will create a small ball by entangling her eggs with fine silk that she produces. She will carry they eggs with her until they hatch, guarding them safely from other spiders. The female Daddy Long Leg will stay with her spider lings until they mature. Daddy Long Leg Spider will eat a variety of other insects and is also know to attack and eat other Daddy Long Leg Spiders.